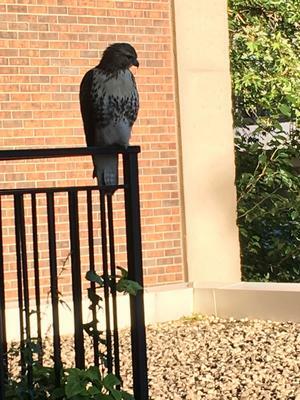 This hawk greeted my son and me in the early morning last week. It had caught a large rat which it is looking at in the picture. It would eventually eat for about half an hour then left the carcass, only to return and take it away later that afternoon. I would love to know what kind of bird this is? Thanks, Dan, for sending us this report and your great pictures. I'm sure one of our readers will be able to identify this bird, but I will also post this on our facebook page. 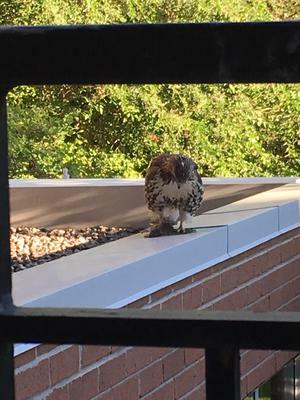 Definitely a Red Tailed Hawk. What you have there is member of the Hawk, (Bueteo) family. Specifically, a Red-tailed Hawk.